Create your own electronic devices with the popular IOIO ("yoyo") board, and control them with your Android phone or tablet. 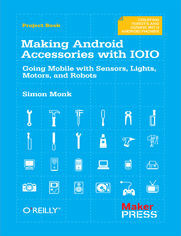 With this concise guide, you’ll get started by building four example projects—after that, the possibilities for making your own fun and creative accessories with Android and IOIO are endless. To build Android/IOIO devices, you write the program on your computer, transfer it to your Android, and then communicate with the IOIO via a USB or Bluetooth connection. The IOIO board translates the program into action. This book provides the source code and step-by-step instructions you need to build the example projects. All you have to supply is the hardware.